Heavy rain and winds are expected to follow in the wake of Storm Freya later this week, forecasters have warned. Wind speeds reached nearly 80mph, trees were felled and roads closed as the weather caused disruption. 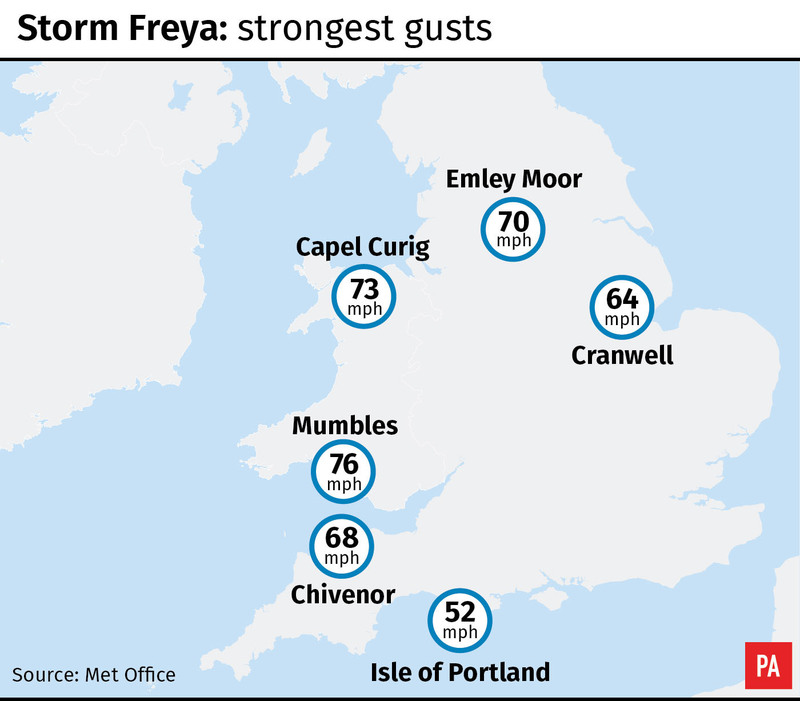 Western and southern parts of the UK bore the brunt of Storm Freya’s strong winds, with a top speed of 76mph recorded at Mumbles Head in West Glamorgan, Wales, at 6pm on Sunday. The highest wind speed recorded in England was 70mph at Emley Moor in Yorkshire, the Met Office said. Dramatic videos of large waves battering Porthcawl in Bridgend, Wales, on Sunday evening were shared online. Mike, from Cardiff, said: “The storm was very powerful on the coast, a couple of the party I was with literally had to grab on to posts in fear of being blown into the sea. South Wales Police were warning of “atrocious conditions” on the Gower on Sunday, while the Severn Bridge was closed westbound due to the high winds. Yellow warnings for wind and snow were lifted in the early hours of Monday morning. “It was a disruptive system, it certainly warranted a warning and naming,” a Met Office spokesman said. The Met Office warned the Atlantic jet stream would be bringing a succession of low pressure systems to the UK in the coming days. While conditions are not expected to surpass those of Storm Freya, there will be a risk of rain, wind and even sleet and snow in areas of high ground in the north. The rain will move into Northern Ireland, northern England and Scotland on Tuesday, with other areas seeing sunnier spells giving way to cloudier conditions and rain in the south west later on.